Several TLC Properties communities across Springfield, MO feature private patios or balconies for our residents to enjoy. Today we want to offer you a few ways you can spruce up that extra extension of your home by offering a few decorating tips for your patio or balcony that you’ll love all year long. Patios and balconies are the perfect spot for enjoying the nice weather and clear skies we often get here in Springfield. Give yourself a chance to relax on the patio or balcony by acquiring seating that you love. Whether it’s a bench, ottoman, stool, or more extensive piece of patio furniture, take your personal tastes and how you think you’ll use the furniture into mind. Take measurements to determine how much space you have and shop around for furniture you can see yourself loving in the upcoming months. Plants do a lot to liven up a space and they take minimal effort, depending on what you want to do with them! Whether you want the plants to serve a purely decorational purpose or even a culinary one, get inspired and use these ideas to determine which plants to choose. Be sure to take into consideration space, how the plants might affect the design or functionality of other design elements of your patio, and how your pets may react to certain plants, to make a smooth transition from the great outdoors to your home. If you don’t like plants and you want something else to decorate with, you can always use any trinkets or other decorative items that you may not have space for inside. A fishing rod, some twinkle lights, a tapestry, or even a decorative or shade umbrella could be a fun addition to your patio or balcony to give your place some personality. 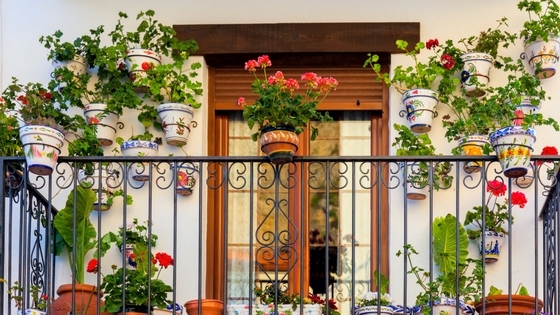 What are your favorite ways to decorate your patio or balcony? Share your tips with the rest of us by leaving a comment! Thanks for reading!